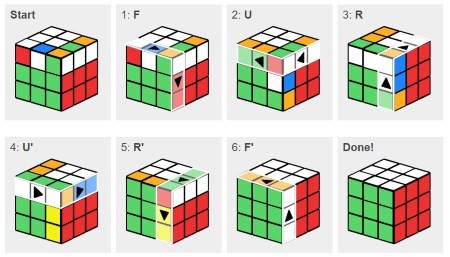 The online Rubik's Cube™ solver calculates the steps needed to solve a scrambled Rubik's Cube from any valid starting position. Enter the colors of your puzzle and click the Solve button. Wait for the program to find the solution then follow the steps to solve your cube. Use this application to play with the Rubik's Cube online. Hit the Scramble button and try to figure out the solution yourself rotating the faces with the buttons or with your keyboard. The app is using the open-source Kociemba algorithm to find the solution in 20 steps for any valid scramble. For slower computers the program automatically reduces the computing performance to return a little longer solution. 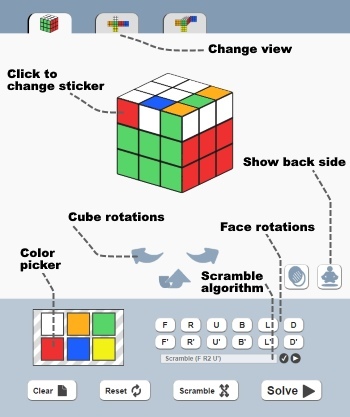 How To Use The Rubik's Cube Solver? Start by selecting the most suitable view for you with the little tabs above the cube. The default 3D view can be customized, setting transparent front faces or you can lift the hidden faces. Rotate the cube with the arrows or swiping the screen. There are two unfolded views which show each faces which helps setting up the scrambled configuration. There are many ways to set the scrambled cube. Do face rotations on the puzzle using the rotation buttons or pressing the corresponding buttons on your keyboard: L, R, U, D, F, B. The capital letters indicate a clockwise rotation of each face: Left, Right, Up, Down, Front, Back. It makes a counterclockwise turn if the letter is followed by an apostrophe. Execute or play back a scramble algorithm in the allocated input field. Copy-paste the list of letters because the program might execute the rotations as you're typing them directly in the field. Mark reverse rotations with lowercase letters or single quotation marks ('). Make the program generate a random shuffle with the Scramble button or revert to the solved position at any time clicking Reset. When the scrambled colors are properly configured and are matching your Rubik's Cube click the Solve command to get the solution. The cube solver will alert you if your configuration is not correct. Pressing the Solve button will leave the scramble page open and open the solution page in a new browser tab. This will allow you to come back to make adjustments if something is wrong. Leave A Comment, Share and Like! This puzzle is undoubtedly an amazin object. Learn more about it browsing the Cube Wiki (Ruwix). We are operating the comment section in order to keep contact with the visitors and to get valuable feedback and suggestions for improving the app. If you have difficulties using the application please read the instructions carefully (available in many languages) and don't say that the website is not working. Thank you for using our online tool! We hope it will help you to solve your cube! Rubik's Cube There are uncolored fields Calculating the solution. Please wait patiently! white orange green red blue yellow Starting position Done! This website is NOT affiliated with, funded, or in any way associated with Seven Town Ltd & Rubiks Brand Ltd, the owner of the Rubik's trademark. This site is using cookies that are necessary to enable you to use the website, and to collect visitor analytics. Please leave the website or adjust your browser settings accordingly.